The location is perfect, right across from the beach and restaurants. I could see the ocean from my window! It was quiet and comfortable. The staff was very friendly and helpful. I had a great stay!! Would definitely stay again! Very convenient for the beach and the street parking was great. Friendly staff. Great location (just a short walk to the beach). Nice apartments, quite quiet, although very close to pubs and restaurants. We loved the help we received at the day of arrival, when we couldn't find the hotel. The receptionist even offered to go out with her own car to to guide us to the hotel. The address offered by Expedia.com isn't sufficient. The same receptionist advised us to good restaurants and beautiful villages nearby and a lot more. The little town Sancti Petri is relative quiet and a beach completely free of large hotels. Bed was comfortable and there were adequate bedding. The facilities were all to a good standard and very accessible. 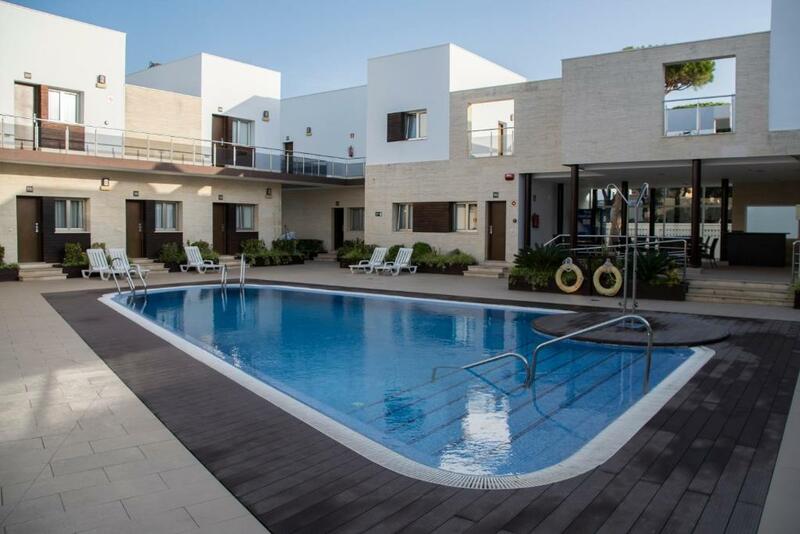 The setting of the apartments was fantastic, 2 storey buildings around a very well kept pool. Plenty of car parking on street, but underground car park only 5€ for 24 hours. 2 roads up from beach and plenty of eating places just across the road. On site restaurant served nice breakfast at reasonable price. Comfortable beds, big fluffy towels, effective heating and cleaning service every day, which is not common in lots of apartments. Friendly staff. breakfast was listed as possible but we had a closed restaurant the whole week. Lock in a great price for Aparthotel Novo Sancti Petri – rated 8.9 by recent guests! Aparthotel Novo Sancti Petri This rating is a reflection of how the property compares to the industry standard when it comes to price, facilities and services available. It's based on a self-evaluation by the property. Use this rating to help choose your stay! Located 350 feet from Barrosa Beach, Aparthotel Novo Sancti Petri offers stylish apartments set around an outdoor pool. 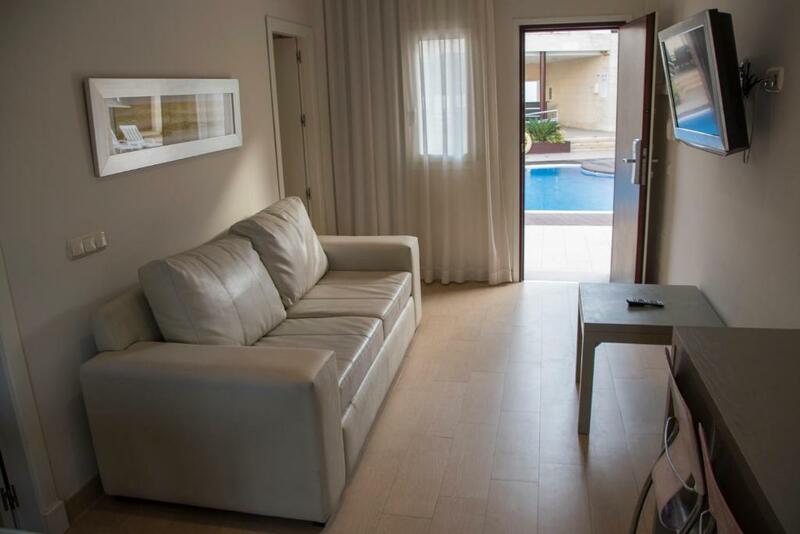 Each air-conditioned apartment comes with flat-screen satellite TV and free Wi-Fi. 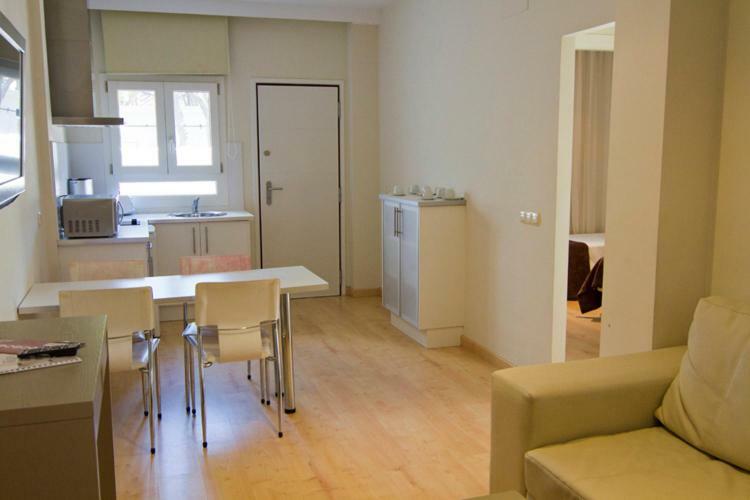 The spacious Novo Sancti Petri apartments are decorated in elegant cream tones. They all have a modern kitchenette, with a microwave, fridge and ceramic hob. The Sancti Petri's restaurant has an attractive terrace and serves traditional Spanish cuisine. Various shops and restaurants can be found within a 5-minute walk, in La Barrosa. Cadiz is less than 19 mi away, and there are 4 golf courses within 1.2 mi of the apartments. This is our guests' favorite part of Novo Sancti Petri, according to independent reviews. 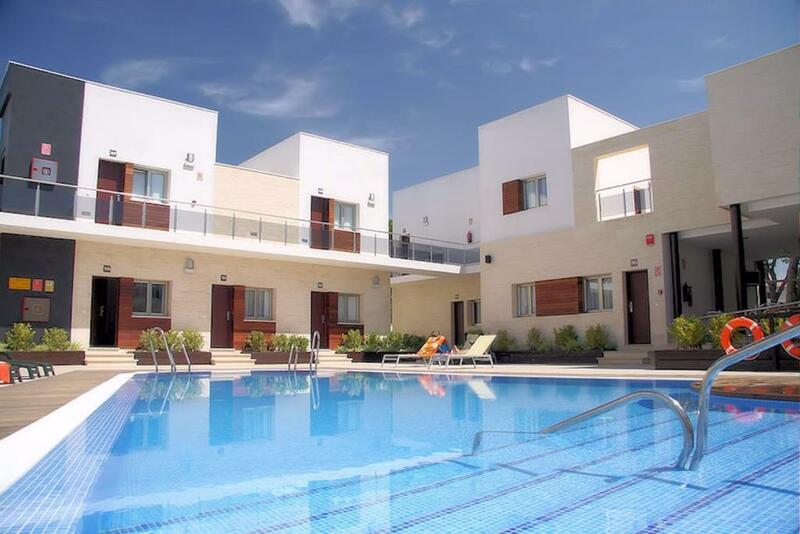 뀐 Located in the top-rated area in Novo Sancti Petri, this property has an excellent location score of 9.4! When would you like to stay at Aparthotel Novo Sancti Petri? Air-conditioned studio apartment with wooden floors. The seating area has a flat-screen satellite TV. There is a hairdryer in the bathroom and the kitchenette includes a fridge, microwave and coffee maker. Air-conditioned apartment with wooden floors and a balcony. The seating area has a flat-screen satellite TV. There is a hairdryer in the bathroom and the kitchenette includes a fridge, microwave and coffee maker. This studio features a microwave, kitchenware and flat-screen TV. Ven a disfrutar de nuestros apartamentos de estilo moderno y equipado con todo lo necesario para que tu estancia sea de lo mas placentero. A escasos metros de una de las 10 mejores playas de Europa, La Playa de la Barrosa y con un sin fin de actividades turísticas y deportivas. House Rules Aparthotel Novo Sancti Petri takes special requests – add in the next step! Aparthotel Novo Sancti Petri accepts these cards and reserves the right to temporarily hold an amount prior to arrival. Please note that half board rates do not include drinks. I was hoping for a balcony. Some room have them, but our room didn't. Good location. Near a beach and a promenade. I liked everything! It's not fancy, but very nice and comfortable, with everything I needed. I didn't like the fact that I made a reservation for 6 people (the apartment we got was for 6 people) but when I got there, I was informed that the complimentary breakfast was only for 3 people. It is ridiculous, why would they offer only 3 breakfasts for a 6 person apartment? I liked the facilities and location. An address that would be recognised by our gps-app. The room floor and kitchen could have been cleaned a little better The chairs in the kitchen were a little dirty It wasn't very clear which towels were face towels and which ones were mats to put outside of the shower, so I was reluctant to using them for my face. 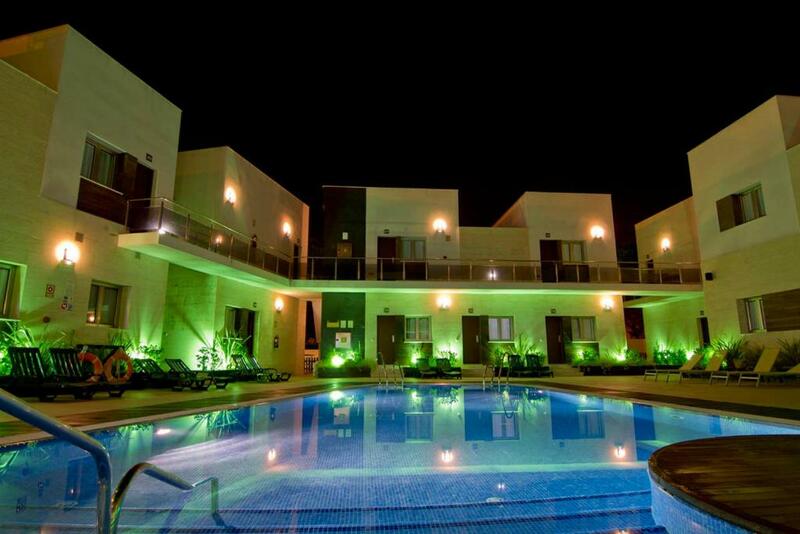 Property was ideally situated very near to beautiful beach. Lots of bars and restaurants within walking distance. Bus services to local town, Chiclana, were frequent and cheap. It is possible to visit Cadiz easily from Chiclana. Apartments were very clean and well looked after. Staff were very helpful and welcoming. Very enjoyable holiday. Get rid of the bidet it's the elephant in the room. Mirrors please!! Only one in bathroom. Surely one in the bedrooms could be added! Also a definite shortage of sockets in apt. There was only one in our bedroom, and that was half way up the wall so no good for charging phones, tablets etc etc. Wine glasses would have been nice too. Don't really like having to drink wine from a tumbler. we were almost alone in the aparthotel and slept next to the street side and the other guests. we heard everything. One of our pillow covers seemed as if it had not been laundered before we arrived. Kind of put us off the whole room. Tricky to find, as Google maps location was wrong. Nice apartment, friendly staff and a great pool!